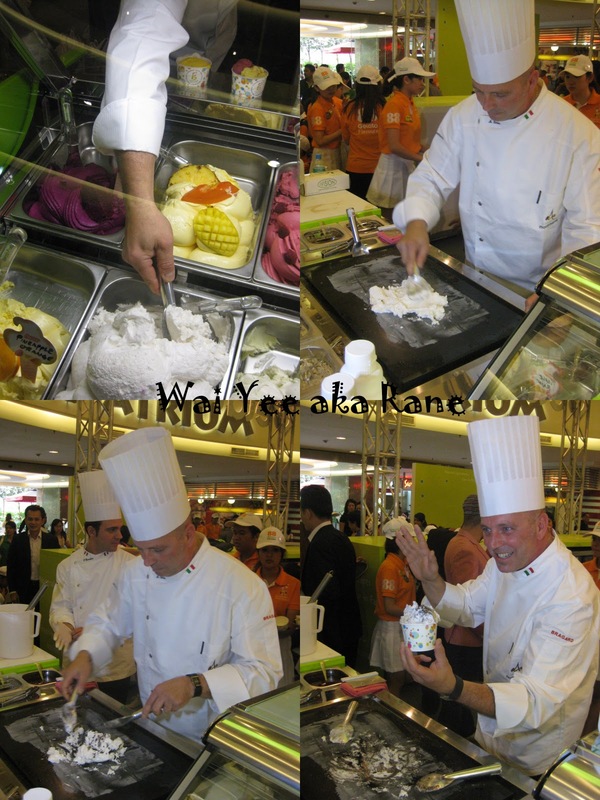 The leading Gelato brand of Malaysia, Gelato Fruity announced the expansion of its gelato menu to 88 flavours. Inspired by the needs of discerning consumers who seek a lifestyle of enjoyment and pleasure whilst seeking for healthier options of desserts to compliment their tentalizing taste buds, Gelato Fruity aims to provide consumers with a wide array of interesting, flavourful and lip-smacking gelato flavours with a hint of Asia included in some of its selection. The launch of Gelato Fruity's 88 flavours marked yet another milestone for the company since its established in year 2007. in line with the company's dedication as a socially responsible corporation, 40 children from Ti-Ratana Welfare Society were invited to join in the celebration and to officiate the launch of Gelato Fruity's 88 flavours. The overwelming joy of the children was apparent in their beaming faces and happy shrieks he moment they saw the backdrop resembling a gigantic gelato. Chef Stefano Cavalca demonstrated the making of gelato. Made fresh daily at the Gelato Fruity factory with the healthiest of ingedients and fruits, Gelato Fruity has followed the same traditional Italian recipe to ensure consumers have the opportunity to savour premium quality gelato. With the state-of-the-art facilities utilized, the gelato produced in Gelato Fruity's factory is assured of the strictest quality control as well as the latest in food technology. "Our consumers are always our first priority and we are committed to constantly provide everyone with superior quality of gelato that is synonymous to Gelato Fruity. We hope that the rich, creamy taste of gelato produced will win the countless hearts of fellow Malaysians who yearn for a taste of real Italy when it comes to gelato. With our many outlets, Gelato Fruity constantly strives to excel in the field of gelato manufacturing and retails" said Ms Vivian Yap, Managing Director of Gelato Fruity (M) Sdn Bhd. To commemorate Fruity announced that all consumers will be entitled to a 30% discount on the 30th of every month beginning this November. Mark your calendars, this 30th for a 30% discount on Gelato Fruity flavours. You can enjo Gelato Fruity either in a cup or in our crisp wafer baskets!